Abuse of A Vulnerable Adult is abuse, where in the victim is over 60 years old, the abuser controls 100% of the finances and the victim is being forced to live in an unfit, unsafe and or dangerous situation. 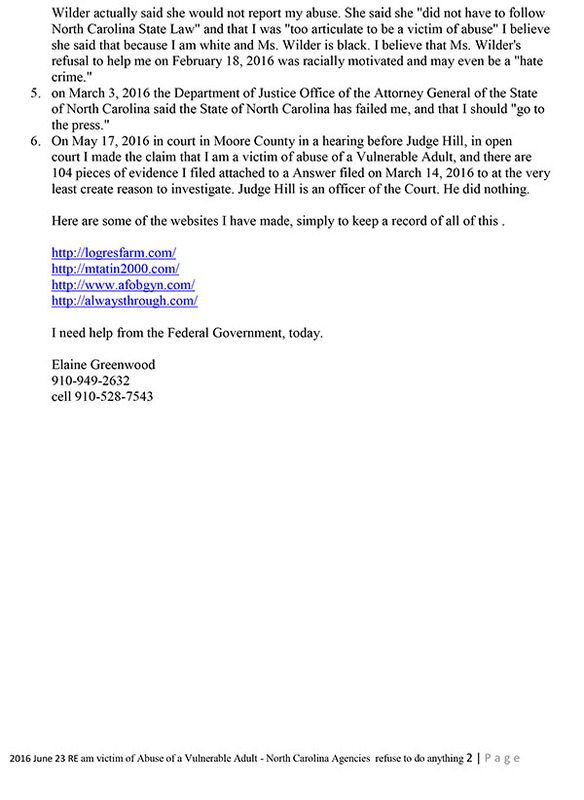 Here are the North Carolina General Statutes for Abuse of a Vulnerable Adult. 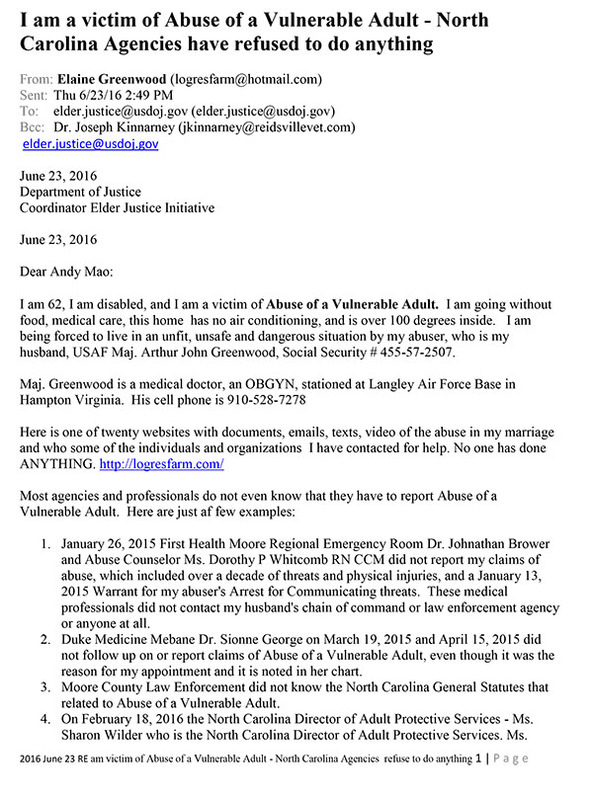 Here is an email I sent to Mr. Andy Mao who is the head of the Department of Justice Coordinator Elder Justice Initiative on June 23, 2016. Apparently no one in Congress has bothered to fund programs that help victims of Abuse of a Vulnerable Adult, which impacts the fastest growing segment of our society. Government reports have indicated for years now that Abuse of A Vulnerable Adult is growing. It will very likely impact you or someone you love. Things have gotten worse since February 2, 2015, in large part because I have been injured many many times since those videos were taken. In July of 2015 Arthur took $5,675.00 from my bank account without my knowledge or consent. That money was to be used to pay a licensed electrical company to do what was possible to provide safe temporary electoral service for me and the horses. As a result of Arthur taking the money from my account, I went without air conditioning in 100 degree heat, and slept in my van much of the summer. Here is a video of how I have to bathe. VIDEO Conditions of home Oct 23, 2015 showing how I have to bathe. VIDEO made 2015 June 27 rain inside and VIDEO Thursday August 20, 2015 made about a week after Arthur stopped providing any support at all for the animals and ordered me to cut back on my standard of living. In November of 2015 I learned that Arthur has the resources to hire civilian attorneys to harass me, and to provide for his obligations here. He is simply refusing to do so. The USAF has known of my husbands conduct for years, and done nothing at all to help me. As but one example of many, here are days of email exchanges with my husband’s commander, USAF Medical Officer Col. Louis Martinez from January 5, 2015 to January 16, 2015, wherein Col Martinez is informed repeatedly that Arthur is NOT meeting his obligations to me or his animals. Col Martinez did absolutely nothing as the animals and I ran completely out of food. Here are email exchanges with USAF Lt. Col Elliot Pinero in January of 2015 and in February of 2015. There are hundreds more emails, texts and phone calls (some of which are recorded). As I write this on January 1, 2016, were it not for the compassion and generosity of a woman who has followed this on FaceBook, the horses and dogs would have been without food for a month now. the victim is over 60 years old, the abuser controls 100% of the finances and the victim is being forced to live in an unfit, unsafe and or dangerous situation. Abuse of a Vulnerable Adult impacts the elderly, who are fastest growing and most helpless segment of our society. Government reports have indicated for years now that Abuse of A Vulnerable Adult is growing. It will very likely impact you or someone you love.